The following is the first of a four part overview of one of the most controversial and least seen books in the history of Edgar Rice Burroughs' most beloved character and most lucrative franchise, John Bloodstone's Tarzan on Mars." The man behind the controversy was the editor of Amazing Stories and Fantastic Adventures, Ray Palmer, a lifelong Burroughs' fans, who had worked with Burroughs himself, serializing the author's last books in the Venus, Mars and Pelucidar series in his magazine. Burroughs passing in 1950 had left a hole in Palmer's fannish heart and the pages of his magazines, and he still longed to go adventuring on Barsoom's mighty sea bottoms. 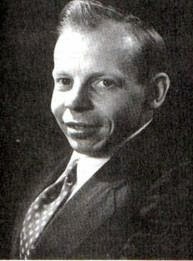 Palmer had been ousted from his position as editor of Amazing and Fantastic Adventures, published by Ziff-Davis publications, in the wake the result of a palace coup engineered by his seemingly envious protégée, Howard Brown, and had founded his own company, publishing Other Worlds. But for some reason, he couldn't let go of the idea of reading further exploits of Tarzan and John Carter so easily. At some point, Palmer conceived the then bombshell notion of having some writer with a similar style and milieu carry on Burroughs' characters and their adventures. This seems little more than wise marketing practice today, when the work of author's with characters who have become franchises, like James Bond and Nero Wolfe, are continued on by various hired scriveners long after their creator's death. But it was an unheard of practice in those days, and in New York publishing circles would have been looked upon askance. Palmer could have left well enough alone, and might have had some chance of success, after all there is strong textual evidence at least one of his sons might have tried out for the role by ghost writing Tarzan and the Ant Men and Synthetic Men of Mars. But Palmer was the last man to be satisfied by wowing his potential audience (the executors of the ERB estate) with one prodigy when he could simply bowl them over with two. 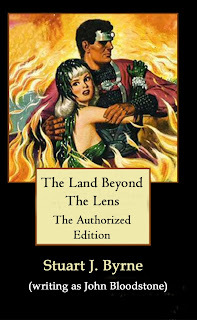 Why not, he seems to have thought, release a literary thunderbolt sure to generate worldwide publicity and drive sales of the books through the roof by featuring, for the first time ever, Burroughs two most popular characters in a single storyline, whose theme and title were self-evident, Tarzan on Mars! Persuading the ERB estate to agree to license a new Tarzan book, given the literary climate and delicacy of negotiating with the author's bereaved family, would likely have been a tricky enough shot, but piling on Barsoom, while literarily adroit, would likely have been a deal killer in any event. "We're embarking on a campaign that looks like the toughest we've ever tried; we're trying to revive the ghost of Edgar Rice Burroughs and cause a successor to be named, to carry on the wonderful characters and stories he created, into new adventures. "We want to perpetuate a continual flow of these stories, because we feel that they would be the most wonderful force for good and for happiness and pleasure for children the world over (even 45-year-old children like ourselves), and supplant, in a measure, the obnoxious literature today being circulated among our youngsters and among our not-so-youngsters. Maybe we're moralizing here, trying to be a reformer, and if we are, maybe it's not such a bad thing. At least, if that's how it's interpreted, we're not ashamed of it. "I've got a son, age five, who will be, in two years, where his daddy was in 1917. We'd like him to be able to pick up a magazine that will thrill him to his toes, and continue to thrill him for the rest of his life, and influence it for good. "We hate to think of him picking up a magazine like "Confidential," and becoming the rotten thing that that magazine is. (Suppose we'll be sued now!—and if so, let's repeat it—that magazine is rotten. It stinks. It is immoral beyond immorality. It is a festering sore on the great body of literature.) Instead of featuring people who have honor, loyalty, love, bravery, integrity, purity, honesty, dependability; can laugh, cry, and use their emotions honestly; they feature all the rotten things that the human cesspool can possibly contain. I want my son to read about good people not rotten people—especially when those rotten people are being glamorized, made "popular," and held up for imitation. about, learn to love, and to make his vicarious companions. And so, I'm crusading now for a new writer to be appointed to write more adventures of these two, and all the others of the wonderful troupe created by the greatest literary benefactor the world has ever known. To do it, I must have a wave of public demand that will overwhelm all objections. To do it, I need every person who ever heard of Rap [Raymond A. Palmer's nickname] to write in, saying they'll back the plan to "Name A Successor To Burroughs", and then, when the signal is given, deluge the Burroughs interests with thousands of letters. "I've asked my readers to write me, suggesting that they enclose a dime to cover the cost of placing them on a list so that I can notify them when and where to write, and what to say. I'm going to keep on asking, until I have those many thousands of backers! I'm asking all who would like to see this done, to join my "Dimes for Tarzan" campaign, and to do it now. "They brought back Sherlock Holmes. Let's bring back Tarzan! And all his friends!" As his own publishing ventures were not doing so well, Palmer's appeal for the dime to simply be added to his mailing list and have your name added to his petition to the ERB people, may have served several purposes. In those days, a first class stamp only cost three cents, a pound of hamburger meat, which would help feed a growing family, such as Palmer's, twenty-nine cents, while the printing and binding costs of Other Worlds was about eight cents, so that dime likely added a not inconsiderable sum to his often meager finances. But out of all this, perhaps the statement that aroused the most controversy was Palmer's blithe remarked that he was not merely proposing someone write a new Tarzan novel, it already existed. Palmer announced, "The first novel has been written; I've read it, and it is terrific. 1,00,000 words of sheer ecstasy (to me, at least—and I consider myself a Burroughs fan of the most fantastic type, from the very first day Tarzan saw the light.)" It would be three months before that author's name, John Bloodstone, would be revealed and Burroughs' fans in a position to determine for themselves whether or not they agreed with Palmer's judgment. But you can read the five classic science fiction novels written by Bloodstone, not drawing on characters from, but emulating distinctive style of, his lifelong hero, Edgar Rice Burroughs, right now, reprinted by Futures-Past Editions by arrangement with the author's estate, at Amazon.com and make up your own mind. Only $2.99 each. 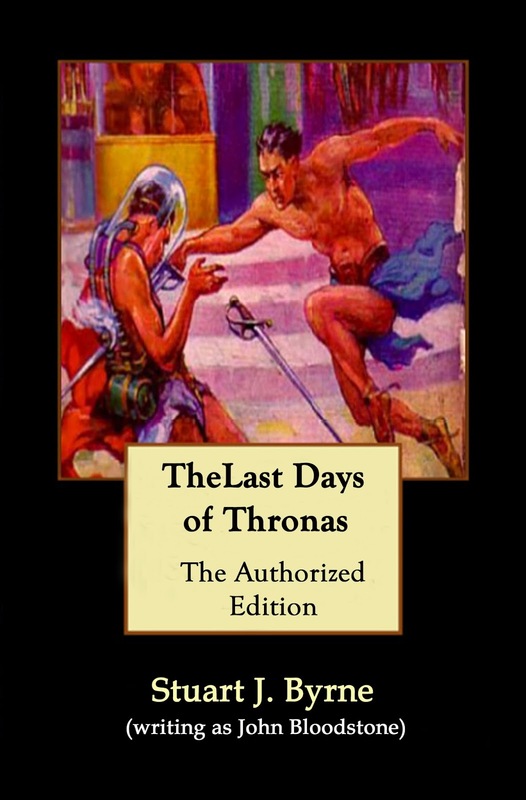 Look for part two of this series, which will reprint Palmers panegyric "Tarzan Never Dies!" which added more fuel to the fire, soon.